In the middle lane dahlias are planted in the open ground in the period from 1 to 10 June. If the soil time to warm up before they can be put divided tubers may 15-20. Recommend this procedure in cloudy weather or at night. Dahlias are planted in prepared plots, pre-set the stakes and digging them holes. The landing site need to be protected from the wind with the help of fences, buildings or trees. Ground water it should not rise above 60-70 cm from the soil surface, otherwise the beds and the beds with flowers to raise due to the deepening of the tracks and grooves of neighboring sites. 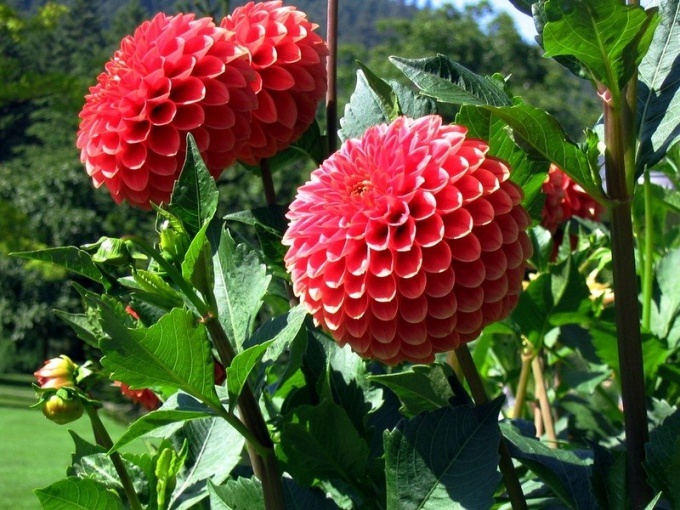 The soil on which grow dahlias, should be absorbent and at the same time permeable. In the ground add fresh or rotted manure, peat, turf ground, compost of different content, leaf mold, straw cutting and other organic materials that are easily decomposed in the soil. To increase the permeability of clay soils, making coarse sand, ash, gravel, washed and screened fine coal slag. In sandy soils add clay, peat or vermiculite. In autumn the land is deeply plowed and dug to a depth of 30-35 cm in the Spring it repeatedly dig up and thoroughly loosen 2-3 weeks before planting. Dahlias are planted at a distance of from 60 to 100 cm apart between rows should be not less than 100 cm Stakes take a height of 160-180 cm, it is best to choose pine wood, they are more durable. They should be painted with green paint, and the lower part to impregnate the 7% solution of ferrous sulfate. You can use metal pipes or pieces of reinforcing steel with a diameter of 12-20 mm. Hammer the stakes to a depth of about 40 cm, and near them the plants are planted so the neck of the tuber was located 4-5 cm below the ground surface. Hybrid seedlings and stick dahlias are planted at a depth of 8-10 cm Plants obtained from divided tubers, before planting abundantly shed water, then gently placed in the prepared hole, taking care not to damage the earth com. For the convenience of watering holes left filled in incompletely or around the plants to create a circular hole. Planted dahlias tied to stakes, as growth continues the garter. In the following days they should be watered abundantly in dry and hot weather is doing on a daily basis. In the future, water less often, but the soil under the plants should always be moist. After each watering or fertilizing the earth loosened. When the buds formed and pinched off the green mass of the plants, cultivation should cease, and the soil should be mulched with peat or humus.